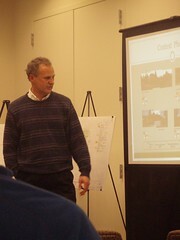 Al Terry, member and architect for Findlay Street Christian Church, presenting at Design Review Board meeting. Photo by Melissa Jonas. Michele Wang introduced Board members and Holly Godard (206-615-1524), the DPD staff contact for the project. Godard explained that this was a preliminary design review only and emphasized that this is not the appropriate venue for sharing SEPA concerns—including concerns regarding parking, traffic, etc. Bev, a congregation member, shared information about the congregation, focusing on their history, philosophy and goals. She opened with a slideshow. The church is interested in developing 18 units of affordable housing—Bev clarified this was not subsidized or low income housing. The location was chosen in large part because of proximity to light rail and the church hopes to attract professionals (teachers, nurses, etc.) who will use mass transit. The congregation also hopes to create a space the community will use. She mentioned the potential of using the sanctuary as a theater or meeting space. Bev noted that the congregation is currently meeting in Mount Baker and has about 80 regular attendees, with a goal of about 125 maximum. They are intentionally a smaller congregation, not a “big project church.” Findlay Street Church was established in 1906 and has a long history in SE Seattle. When they sold their Hillman City property, they sold the parking area below market rate for use as a P-Patch to promote green space in perpetuity. They are currently meeting in Mount Baker while they develop their new, permanent space. When questioned further about why the congregation had chosen North Beacon Hill, the response was that the site was available, affordable, and met the needs of the church. The congregation is also attracted to the vibrancy of Beacon Hill and is interested in being part of the community. Al Terry is another congregation member and also the architect for the project. He presented three options for the building, emphasizing the church’s goals for green construction and the financial constraints of the project. The option the congregation preferred included a building approximately 100 by 40 feet with a tower rising above the primary roof. The roof is designed as a “green” roof with a landscape garden. The tower is a combination of visual interest and a practical way to handle heating/cooling systems. One proposal included six parking spaces, which would increase the cost of the project by an estimated $250,000. Because of the increased expense and the way parking would adversely affect the configuration of other spaces, the congregation prefers the design option without parking. The 18 units of housing are intended to be a combination of 350 square-foot studio apartments and 500 square-foot 1BR units. The design includes lots of windows and orients the residential units around a courtyard to provide as much daylighting as possible for residents. A long-term goal is to install solar panels, and the current design proposal is oriented towards leaving that option available. During the question and answer session, Al explained that they are focused on small, dense units primarily to help pay for the building. In response to another question, he said that the congregation is interested in offering family-size 2 or 3BR units, but did not elaborate on whether this would be possible within their financial constraints. Al and Bev both emphasized the importance of having “eyes on the street” and noted design features intended to enhance visibility and promote safety for building residents and the greater community. The congregation appears well aware of what one BH resident described as a “sea of drunkenness” in the area. I had the opportunity to speak to several congregation members in the lobby after the meeting—including a current South Precinct Community Service Officer and a former Seattle Police Department member. They are aware of the crime and safety concerns around “the Jungle” and believe the church will improve the safety of the neighborhood. Some other questions included concerns about the design being too austere (“a little flat box”) and mention of the Beacon Hill Design Guidelines suggesting a corner entrance. Al explained the exterior materials would be textured 8 by 16 foot tiles made from sandstone and featuring fossils for visual interest. These tiles would be combined with fiber cement panels. Regarding the entrance being centered instead of on the corner of the building, Al explained that the slope was almost 10% and would present difficulty to building residents and other users with impaired mobility. After the public comment period, the Board deliberated and announced that they support the option preferred moving forward to apply for a Master Building permit. There will be many opportunities to review and comment on the design. Al Terry and other congregation members will be attending the North Beacon Hill Community Council meeting next Thursday, March 4. If you have questions or would like to get to know our future neighbors, come to the meeting! Great thanks to Melissa for attending and sending in a write-up of the meeting! — Ed. Melissa, Thanks for the great reporting on the meeting. Much appreciated since I wanted to attend but couldn’t. Melissa thanks for attending and thanks for the information. I still think the small units will be hard to rent in this location.